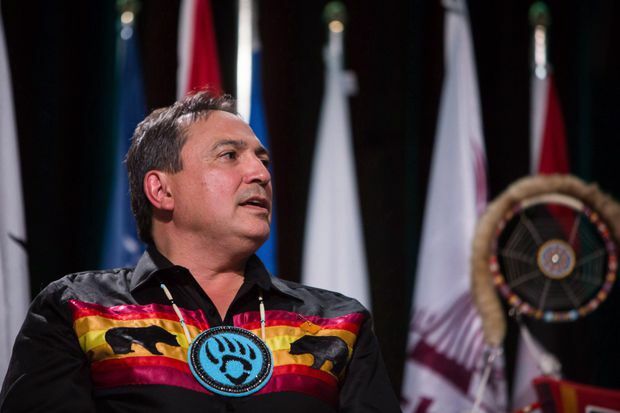 Perry Bellegarde is sworn in after being re-elected as the National Chief of the Assembly of First Nations in Vancouver, B.C., on Wednesday July 25, 2018. The main sticking point has been choosing a date for the annual event. “The overall picture is that it is important to have that day set aside so Canadians continually get it and will never ever forget the impact of genocide in the residential schools on Indigenous peoples,” Perry Bellegarde, the National Chief of the Assembly of First Nations (AFN), said in a recent telephone interview. The AFN is among several groups the federal government has consulted as it prepares to announce the creation of what is expected to be known as the National Day for Truth and Reconciliation – one of the 94 calls to action of the Truth and Reconciliation Commission (TRC), which spent years investigating the abuse of children at the church-run schools. The AFN initially said the National Day for Truth and Reconciliation should be on June 21, which is National Indigenous Peoples Day. But the government was concerned that would be too close to St. Jean Baptiste Day, a Quebec holiday that is celebrated on June 24, and also too close to Canada Day. “We’re pushing to advocate for a national day, a statutory holiday, for reconciliation, whether that be June 21, or that be Orange Shirt on Sept. 30,” Mr. Bellegarde said. The Inuit Tapiriit Kanatami, which represents Canada’s Inuit people, says the government has discussed the issue of the statutory holiday with the organization, but not engaged in formal negotiations. Prime Minister Justin Trudeau promised in late 2015 to enact all of the TRC’s calls to action, although the government has since clarified that the commitment extends only to the 76 that fall within federal jurisdiction. Although 27 of its responses to the commission’s recommendations are still in the very early planning stages, government officials said efforts to create a national statutory holiday are well under way. Metis Nation of Alberta members vote to support expansion of Trans Mountain pipeline through B.C.